Alleson 554PW/554PWY Women's/Girls Mesh Multi-Sport Shortsare made of 100% Cationic polyester mock mesh with moisture management fibers. It has a 100% polyester tricot knit double thickness liner in white body colors only. It features multi-colored side and back inserts with two rows of contrast color self-material piping that starts at bottom of sides and curves across seat and straight down sides. It also features a 1 1/2" covered elastic waistband with inside drawcord. 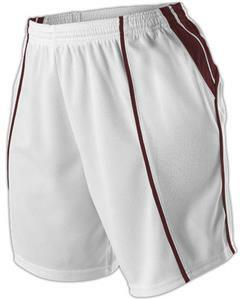 This short is made of 100% Cationic polyester mock mesh with moisture management fibers. It has a 100% polyester tricot knit double thickness liner in white body colors only. It features multi-colored side and back inserts with two rows of contrast color self-material piping that starts at bottom of sides and curves across seat and straight down sides. It also features a 1 1/2" covered elastic waistband with inside drawcord. Available sizes and colors will be listed in the drop down menu. *Possible surface or fabric imperfections. WAIST 20" 21" - 23" 24" - 26" 27" - 29" 30" - 32"
WAIST 25" - 26" 27" - 29" 30" - 32" 33" - 35" 36" - 38"
INSEAM 6-7" 6-7" 6-7" 6-7" 6-7"